Opera is not the first browser to get its own apps store. Firefox and Chrome already have their own and much popular app store. 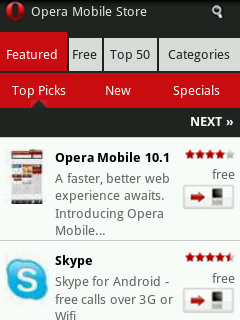 Just to be a starting point, Opera Mobile Store is another app store. The Opera Mobile Store had been launched and is powered by Appia, which also provides app store system for big names like AT&T, T-Mobile, Verizon and others. If you access the Opera Mobile or Opera Mini browser from your device right now, the Opera Mobile Store will appear on Dial pages and gives access to free as well as paid apps. The pre-launch testing of this app store saw a big success. The best and weird thing about Opera Mobile Store: Apps can be purchased for all platforms including Android, BlackBerry, Java, Symbian and Windows Mobile and even if if you don’t own that device.